The 1304G Mobile Insulation Vacuum is ideal for small residential jobs. With the Honda 13.5-Horsepower Engine, the 1304G makes insulation removal a breeze! 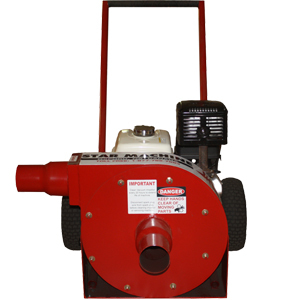 The 1304G Mobile Insulation Vacuum is our smallest vacuum with a 13.5 HP Honda® engine and a 4” diameter inlet and outlet. This machine is mounted on a carefully designed cart with 16” pneumatic wheels that allow you to balance the machine for easy mobility. The 20” diameter impeller and it’s housing are both crafted from ¼” back plate steel for maximum durability, and is electronically balanced for smooth, long-term operation of the impeller. We have also offset the impeller to stop insulation material from collecting around the impeller during use. This model is built with a 1.6 U.S. gallon gasoline tank, electric start with a full sized car battery, and low oil alert. These features combined with the removable handle make this machine incredibly convenient to use and to store. When the handle is removed to save space, this insulation vacuum can be easily strapped down and mounted in a trailer or truck if needed. *Prices are subject to change without notice. Prices do not include crating, freight, accessories or applicable taxes.